So, I have much to report from the nation's heartland (photography class with Franklin Habit at Loopy Yarns and checking out two brand-spankin' new yarn stores in Door County with my mom), but that will have to wait because I need your advice, dear readers. The groovy people at Soho Publishing, publishers of Vogue Knitting amongst others, is looking for a Yarn Coordinator. Right here in NYC. ... I know! It sounds like one of those potentially thankless-to-some jobs that we Virgos love: all organizing, coordinating amongst editors, designers, and yarn companies, making lists and spreadsheets, ooh, maybe databases, and stuff like that (according to the job description). The problem is that I have to write a cover letter. And it's been a while since I wrote one of those. I have no idea what to say without sounding like a fan-girl or a space cadet or a senior art director, which is what I was in my past life. What do I write?! "Hey, I love yarn and am an 'exquisitely focused knitter' (I prefer that phrase to 'obsessed') who needs a job. I'm highly organized and love setting up databases to keep everyone else around me organized as well." I never liked writing cover letters, but at least in my last few job searches I could let my design samples and resume do a lot of the talking for me. Having spent the last couple of years hanging out with preschoolers and the screaming bébé (thank goodness she's turned into a delightful almost-toddler) hasn't helped my business communication skillz. So, if you have any ideas on how to phrase things, let me know. Can I get an "Alpaca, Amen!"? I had a fantastic time at Fiber Revival yesterday down in Newbury, Massachusetts. Such a good time that I only took a few pictures. But I got to see deardear Tink and Wink with their traveling version of the best little yarn shop in Massachusetts, along with Knit Night pals Joanne and Suzanne who were doing their best stash management by buying fluff instead of finished yarn - takes longer to use it up if you have to spin it first! I took a two-handed fair isle class from Isobel Abelson (yes, spelled like my daughter Isobel), who was great. And now I get it! Weaving as you go is so much better than wrestling with floats. All sorts of new ideas are bubbling around in my brain. It was fun to talk Knitting with someone so knowledgeable. And we had a little two-person Joan Schrouder fan club. To top it off, Isobel had a great idea to fix something elegantly on a design project, rather than having to rip out the neckline and reknit it. In the small world files: Isobel and her husband lived one block away from our apartment when he was at Columbia Law School ... with Ruth Bader Ginsburg, whom she said was a mensch, which I heartily agree with even though I've never had the good fortune to meet the lady. To make the class more fun, it was held in "Screen House B", which was one of those mesh screen tents. Ours was set up around back of the house near the chicken coop, which was also home to a big, white tom turkey who stalked around our tent with his tailfeathers unfurled. And I got to meet Julia. I was having such a good time talking to her (and then had to dash to drive the two hours home) that I didn't get to look at the binder she casually mentioned. The binder with pictures of all the new Twist Collective projects. [facepalm] What?! Seriously? I felt like such a doofus last night. Thank goodness the new issue launched today, so I only had to kick myself for twelve hours or so. So, have you seen the anniversary issue? Go! I'll wait... Really lovely, eh? Very nice patterns and a great mix. I thought Cher Underwood Forsberg's men's sweater Urbanite was really handsome. Loved the Rococo gloves by Julia Mueller (I knit her Knotty Gloves for my grandmother last year). And I am adding the Cottage Garden pullover by Cheryl Burke to my queue right away - perhaps just for the adorable double-picot hems, though I'm itching to try my two-handed colorwork skillz. And let's not forget Mari Muinonen's Luminen - my problem is I have a white, wool, long jacket, but it doesn't have a hood, or those amazing cabled pockets, or those snowflakes on the back, nor is it out of Mountain Mohair. What's a knitter to do? But the sweater I really want to knit isn't a pattern in there - the sweater Elizabeth Zimmermann knit for her goddaughter. Jared Flood's photographs are lovely, aren't they? I'm crazy about the sleeves. I've already sent an email off to Schoolhouse Press asking about it (see the article). You should, too! I'm trying to blog more regularly, but it's not as easy when you want to include pics but are working on seeecret projects (well, projects that shouldn't be photographed before they are accepted/rejected to online publications). And internet access is only working on Nick's laptop, while I like to keep the pics on mine (where Photoshop lives). Plus, I prefer blogging FOs with pics, much prettier than jumbly in-progress shots. Anyway, I'm close to finishing up the project I want to submit this week and am pretty psyched with how it's turning out. The gals at Knit Night approved. I would only need to submit a swatch and sketch this week but really wanted to knit it up to make sure it will actually work, since I don't want my doodles to write a check my needles can't cash. If it is liked I can spend the model knitting time grading the pattern, which I have yet to do. And I'm kind of waiting for my dear sister-in-law to have her baby to show you the things I've knit for said baby. As an aside, I've read a number of blog reports from Sock Summit, and I just have to say that it's Meg Swansen (not Swanson). I'm sure it's just jealousy on my part, but if you get to meet the lady (wonderful in her own right *and* the daughter of Elizabeth Zimmermann), spell her name correctly. They'd better have another Sock Summit next year, and I'd better figure out a way to go. I'm working on a sweater for Penelope for her birthday (why, yes, it is today, and I started on Sunday, with sock yarn, but it's August, so she doesn't really need a sweater *today* today). Anyway, it's a top-down raglan cardigan that I'm winging. Apparently, I don't have a set of US6/4.0mm DPNs but do have an Addi Turbo (cue light saber sound effect). I think the problem is that I only have 44 little stitches on these needles, so I am constantly having to shift the cable. Gah, I think I'm going to frog the sleeve and knit it flat - the sleeve is small and the yarn dark (BMFA's Socks That Rock Lightweight in Lenore from the 2007 Rockin' Sock Club) and practice seaming is always good. Ah, that's better. I can purl far faster than I can wrassle cables. Off to figure out rate of decrease on the sleeves. Or should I leave them full and decrease rapidly at the cuff for a little puff? Today is Elizabeth Zimmermann's birthday, so knit on with confidence and hope through all crises! What are you knitting today? I'm working on a design in which i-cord and circular knitting play prominent roles - very EZ. And if you haven't seen this online companion to the New School Knitting exhibition of 2006, check it out. *If you don't have Knitter's Almanac, why not order it from Schoolhouse Press (scroll down a little ways) today? It is such a wonderful book. Ah, nothing like putting on a pair of wool socks in August. The things we do for our blogs. I am looking forward to wearing these, though, when the weather gets nippy. They fit like a dream, particularly for my spaghetti toes. The ability to try on as you go is great for people with long feet like mine. Way back when I started these, I think I tried using a US2 needle, which made for a floppy fabric, not what you want in your socks. I ended up going all the way down to the US0 needle but broke one of my bamboo ones before I found these HiyaHiyas. I used the metal ones, which are very silky (I find Addi Turbos too slippery sometimes, though they work well for certain projects). I'm looking forward to the interchangeable set that is coming this fall from HiyaHiya. Perhaps right around my birthday next month? Anyway, the first sock went quickly, but I suffered serious Second Sock Syndrome (SSS), which might be alleviated on future sock projects if I chose socks with, you know, patterns or something. I keep trying to convince Nick to take up sock knitting (he's a nail nibbler) to keep his hands busy. And I'd get socks out of the deal. But he's not buying it. The picot edge flips a little, as you can see in the heel picture, so I may redo it. But for now they are done and ready for the cold weather sure to come eventually. Don't you like the heel? I think the way the yarn sort of bull's-eyes is cool. OK, off to work on a design. It's a good distraction from Isobel's father's visit. Luckily, she's having a great time, so it's worth it. P.S. Like the lobster-red adirondack chair in the heel shot? It finally stopped raining long enough for Nick to paint them - pretty fabulous. I'm very excited to have signed up for a couple of classes in the next few weeks. Two-Handed Fair Isle at Fiber Revival on the afternoon of the 15th, and it turns out that the teacher, Isobel (yes, spelled just like my Isobel), once lived a block from our apartment in New York, though she now lives in Portsmouth. It's a small world out there, especially in New England, I think. I'm really looking forward to improving my colorwork skills. And if that doesn't work, I hope to find some way to get back up here to Maine the first weekend in October to take Mary Jane Mucklestone's class at Purl Diva. 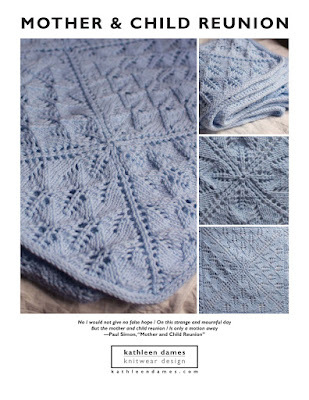 Did you read the profile of Ms. Mucklestone in Interweave Knits by Julia Farwell-Clay? I haven't yet, but Nick should be bringing my issue back from NYC tomorrow, and I'm looking forward to it, as well as the rest of the issue. And I'm looking forward to attending the Fiber Revival, which, I believe, began in 2007, not long after I left Boston's North Shore for Chicago's. I hope to see old friends and make some new ones. Then I get to meet Franklin Habit. Finally! Between Chicago, New York, Boston, and Mid-Coast Maine I should have met Mr. Habit long ago, but somehow it never worked out. Now, it's working out perfectly. I'll be able to take his Photographing Your Knitting class at Loopy Yarns on Saturday the 22nd. We arrive in Chi-town on Friday to see my dear in-laws and meet our new niece (Nick's sister is pregnant with her first baby - knit pics to appear in this space shortly), then we'll head for Door County after my class to spend the week with my family (my parents, my brother and his wife and their two kids; sadly for us my sister will be just getting back to Germany after a month in Afghanistan, so we won't see her until Christmas). Somewhere in there we need to see my BFF and her family, too, especially as her little big man just broke his leg. Ugh! Poor everyone. Any thoughts on entertaining an active, sports-enthusiastic almost-five-year-old in a full-leg cast? While keeping the toddler man happy, too? And I thought I had it bad in my rain-soaked, doorless cottage earlier this summer.